Screenshot from Da Mao’s celebrated snow-frolicking video. We don’t know what Belgium’s Hao Hao or Spain’s Xing Bao have on Toronto’s own Er Shun, but we’re still glad she’s been recognized as the world’s third-favourite giant panda not currently living in China. 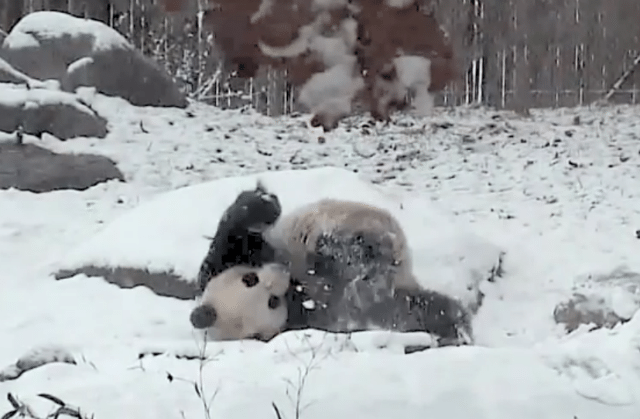 We’re shocked that her companion Da Mao didn’t make the cut and can only assume that voters were unaware of this video, which shows him rolling around in snow. If you recently heard about a City garbage bin that had been slapped with an attractive and instructive landfill sticker and thought, “I would like to get my hands on just such a landfill sticker,” well, now you can. And if you purchase one, you should obviously put it to use and not, say, casually throw it out, because that would be very stupid. It is currently very cold in Toronto, but at least we’re not helping #blizzardof2015 and #Snowmageddon2015 trend on Twitter—unlike New York and New Jersey, each of which has declared a state of emergency because of all the snow that’s headed their way. Dozens of flights into and out of Pearson have been cancelled, but again, at least we’re not facing #blizzardof2015 or #Snowmageddon2015.